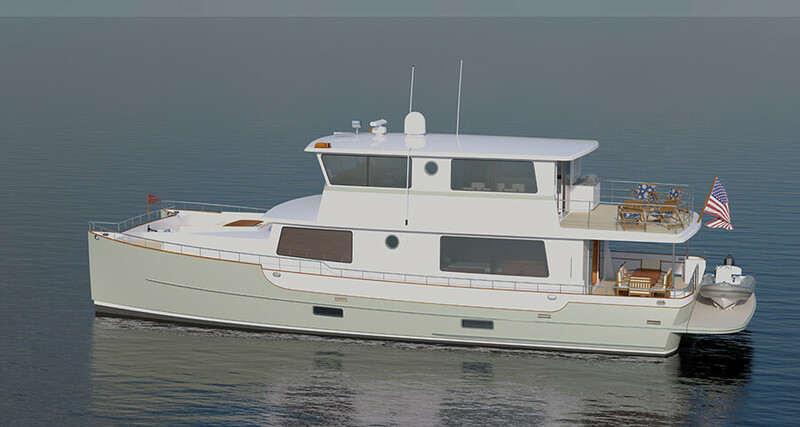 Zurn Yacht Design has teamed up with New England Boatworks to announce plans to build the Zurn 60 Powercat. This three-stateroom, fve-head cruising yacht shows careful consideraton for the comfort and privacy of passengers and crew with a truly revolutonary powercat layout. 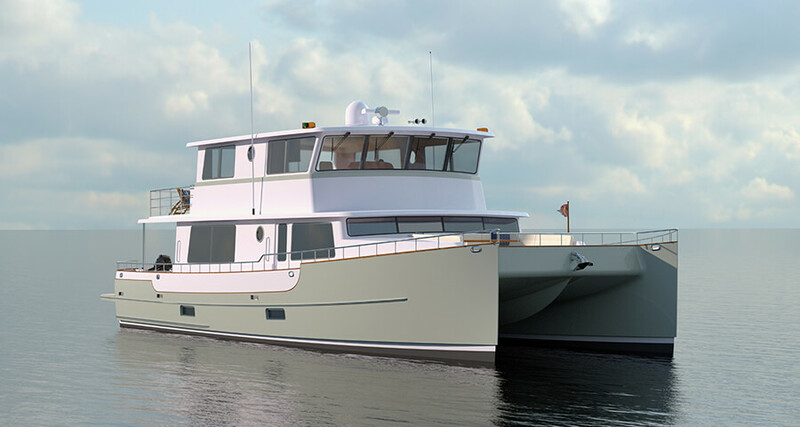 The concept came from Doug Zurn of Zurn Yacht Design, who worked with a prospectve owner with open-ocean cruising experience. New England Boatworks, located in Portsmouth, Rhode Island, is a leader in building power and sail yachts using advanced methods and materials. The Zurn 60 Powercat is a groundbreaking design that showcases the out-of-the-box thinking that has long made Zurn Yacht Design a leader in the yachtng world. The radical confguraton starts with the main deck, where a master stateroom forward uses the full width of the deckhouse for a 270-degree feld of view through expansive picture windows, as well as four large forward windows overlooking the foredeck. The master is entered from a door on the starboard side deck and features a king-size berth on centerline, as well as a setee and a wide desk along the af bulkhead, a suitable workspace for running the ship, or monitoring business interests from anywhere. Stairways to either side lead to his-and-hers head compartments located on the lower deck to port and starboard. A curving staircase at the entrance leads to the skylounge. The master stateroom has his-and-her heads, divided and situated on the lower deck in each hull, down a staircase on either side of the stateroom. Each of the heads has a dressing area with lockers, a sink with mirror, a private head compartment and separate shower with bench. A pair of mirrored guest staterooms are abaf the master, also on the main deck. Because these af staterooms are on the main deck, guests are greeted by enormous windows looking out over the sea. Each guest stateroom is a paragon of privacy, with insulated bulkheads atenuatng sounds from other guests. Each stateroom has twin berths, but doubles can be fted. Plenty of stowage is concealed in fnely fnished joinery, ready to welcome guests for extending cruising. “Everybody gets a private, quiet corner of the boat,” Zurn says. “And with engines and generators placed well af in engine rooms insulated by Soundown perforated aluminum, that will be true throughout the tme onboard, whether under way or at anchor.” Zurn also noted an available solar-panel array that would help reduce generator use. The guest staterooms each have their own head positoned directly beneath on the lower deck. The guest heads are equipped with a private toilet compartment and separate shower. Each guest head is insulated from the respectve master head forward in each hull by a mechanical space where onboard equipment is housed, including water heaters, a watermaker, and more. While a main-deck master on a 60-foot cruising yacht may be pioneering, it’s the focus on cruising that makes the Zurn 60 Powercat revolutonary. The positon of staterooms and heads is more than just convenience and spectacular views—it’s a design feature that allows the yacht to have the narrow hulls to create cruising efciency and performance, as well as a draf of less than four feet. Powered with a pair of 435-horsepower Volvo Penta IPS600s, the Zurn 60 Powercat is expected to cruise at 18 knots and top out at 23 knots, with a range of 500 nautcal miles at 18 knots. The views only improve when one considers the bridgedeck and skylounge, with all-around windows. With access by stairs from the af deck or the master side-deck entrance, the upper deck is the primary indoor entertainment space on the yacht, where the skipper can oversee the navigaton while also enjoying the company of guests. The helm staton is forward and to starboard, with a pair of helm chairs, allowing the helmsman and companion to maintain watch and chart the yacht’s progress, with a large fat chart table to outboard. A reverse pilothouse windshield capitalizes on deck space while reducing glare and improving sightlines. A large L-shaped setee is opposite, surrounding a table suitable for cofee or cocktails. Substantal open deck space allows for the placement of loose chairs or other furnishings as desired, or fxed furniture can be specifed. There’s a dayhead to starboard. The stairway from the af deck is fanked by the galley to starboard and a formal dining area to port, each beneftng from large windows in the sides and af bulkhead. The dining area has a large sliding glass door in the af bulkhead that opens onto an open upper deck af. The galley has the U-shaped design of a true cruising galley, with a stove af and a large workspace outboard. The galley’s af window opens wide to simplify serving an al fresco grilling staton. This af deck space is lef to the owners’ devices, to be used as an outdoor dining area, a casual lounging area, or kept wide open for fexible use, from yoga at dawn to an evening disco. Back on the main deck, the af deck is sheltered by the fying-bridge overhang, and features an outdoor dining table with seatng for eight. A hydraulic swim platorm is set to be level with the main deck, so step-through gates lead to the platorm, which can stow, launch, and retrieve an outboard-powered RIB tender. A recessed atrium with sliding glass pocket doors in the af bulkhead of the superstructure has doors to the guest’s staterooms set at angles to port and starboard, fanking the centerline staircase that leads to the bridgedeck and skylounge. Wide side decks lead to the foredeck. The forward cockpit is centered on a U-shaped setee with a table ofering stll another gathering spot, with an available bimini sun shade that can be set on carbon fber poles. Call for further inquiries and look for more news as the development of the Zurn 60 Powercat contnues in the coming months.